The spire and roof of the Notre Dame Cathedral has collapsed, with eyewitnesses sharing pictures of the devastating damage. AFP correspondent Patrick Galey has shared footage on Twitter of the gut wrenching moment the iconic spire fell. There’ve also been eyewitness reports of people crying in the streets of central Paris, as centuries worth of French history went up in smoke. No deaths or injuries have been reported at the time of writing, but those in the French capital have been advised to stay away from the area. 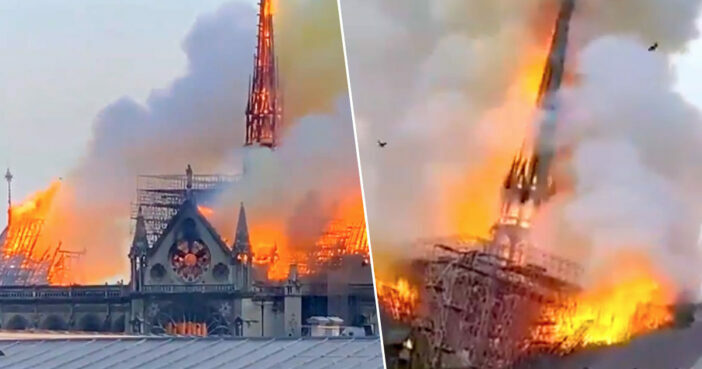 The area surrounding the 850-year-old gothic cathedral has reportedly been subject to a major evacuation, according to a spokesperson from the police department. A spokesperson from the Parisian fire department has described the fire as having started in the afternoon of April 15, with a major operation under way. It’s thought the fire could have been started accidentally, with no indication it was started deliberately. Fire fighters have said the blaze broke out in the attic of the cathedral, and could be linked to ongoing renovation work. There’s no official word as of yet as to how the fire started. It’s understood scaffolding had been erected around the building, with renovation work having been underway. A terrible fire is underway at Notre Dame Cathedral in Paris. Paris firefighters are trying to control the flames. We have mobilized to the scene, in close communication with the Paris Diocese. I urge everyone to respect the security perimeter. Due to the terrible fire ravaging Notre-Dame-de-Paris, the President of the Republic has decided to postpone his speech. As reported by the Independent, the Paris prosecutor’s office have started an inquiry into the blaze. Notre Dame Cathedral has stood since 1260, having been modified throughout the centuries. It’s provided rich inspiration for writers such as Victor Hugo, and is regarded as one of the most culturally significant and instantly recognisable buildings on the planet.